Posted April 2nd, 2017 by Mike Boyes & filed under Basic Cognitive Functions In Aging: Information Processing Attention Memory, Child Development, Cognitive Development: Piagetian and Vygotskian Approaches, Cognitive Development: The Information-Processing Approach, Human Development, Learning, Neuroscience, The Self. Description: We know that preschoolers have trouble with (but are quite cute about) their understanding of other people’s thoughts, especially when other people’s thoughts are different than their own. If you show a 3.5 year old that a box of smarties (they are like M and M’s but are British/Canadian) contains short golf pencils rather than those delicious little round chocolate candies and then ask then to predict what a newly arriving, naïve to the boxes’ contents, friend would say is in the box the 3.5 year old will usually say “pencils” (and will usually sound depressed about it at the same time). What Piaget referred to as egocentrism (an inability to get past one’s own knowledge to predict likely different expectations in others) and what more recent theorists and researchers have called the development of a Theory of Mind has been the focus a much explanatory debate in recent years. What has always been rather amazing is the consistent finding that the loss of egocentrism or the onset of a functional theory of mind seems to be a qualitative developmental achievement – not there and then there, in fairly short order. Why do you think that might be? The article linked below is offering evidence for a possible brain maturation based explanation. Source: The importance of relating to others: Why we only learn to understand other people after the age of four, Science Daily. The research reported upon in the linked article is a wonderful example (one of two I will be posting on today – the other having to do with the cerebellum and schizophrenia) of how our brain accomplishes its amazing tasks using process that are distributed throughout the brain. In this case properly taking another person’s perspective when their thoughts or expectations are different than our own requires the development and functioning of a fibrous brain connective structure called the arcuate fascilicle. 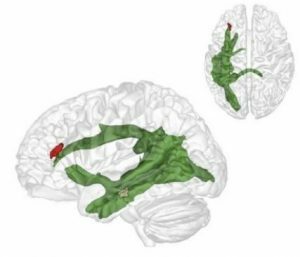 This connective pathway links a region in the temporal lobe that enables thinking about others and about their thoughts and a region in the frontal lobe that facilitates thinking in layers (e.g., like when you are playing poker or trying to fool someone…”they are thinking that I am thinking that they are thinking …”). Working together allows these two regions to help us build a predictively accurate theory of mind and stop behaving in egocentric manners. What do we mean when we say that a preschool child is “egocentric” or that they lack a “theory of mind”? If preschoolers had to “learn” a theory of mind what sorts of experiences would be involved in facilitating such “learning”? How might your answer to question 2 above relate to the results discussed in the article linked above?